> Tidal power comes from the pull of the moon on the oceans of the Earth. The moon's gravitational pull draws the seas on the side of the Earth nearest the moon towards the moon. > This regular rise and fall of the sea can be used to generate power. We call the rising tide the flood and the falling tide the ebb. 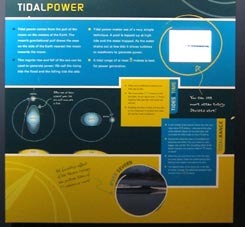 > Tidal power makes use of a very simple technique. A pool is topped up at high tide and the water trapped. As the water drains outat low tide it drives turbines or machinery to generate power. > A tidal range of at least 5 metres is best for power generation. 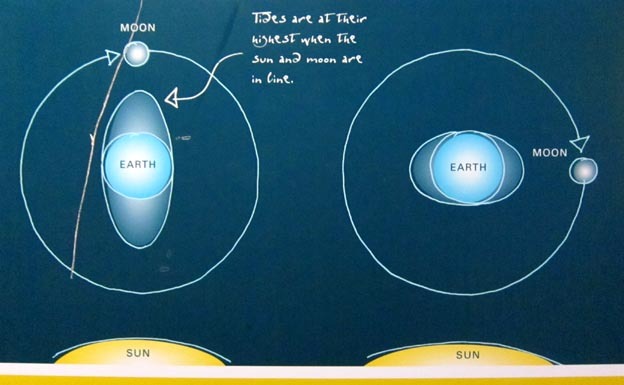 > Tides vary at different locations and from day to day. > The moon takes 24.8 hours to orbit the Earth. As our day is only 24 hours long the tides get later with each rise and fall. > Knowing the time of high and low tide is very important to anyone who uses the sea for work or pleasure. > In the middle of the Atlantic Ocean the tide only rises about 0.5 metres - whereas at the edge of the Atlantic Ocean the sea bed rises and increases the tidal range to about 3 metres. > Around the coast the water is funnelled into estuaries and inlets. This can create an even bigger rise and fall. The funnelling effect of the Severn Estuary can produce tides of 11 metres or more! > When the sun and moon are in line the tides are even higher. These are called spring tides. Spring tides happen throughout the year. > The highest tides in the world are in the Bay of Fundy, Canada. The difference between high and low tide is 16.3 metres. ＊　キャプション→　River Severn:　The funnelling effect of the Severn Estuary can produce tides of 11 metres or more!